Brazil is a country known for MEAT. I haven’t been there, however, my husband has traveled there on business. He has a lot of fond food memories of Brazil but said you can “hurt yourself” at a churrascaria which is where waiters serve hot grilled meats tableside fresh off the skewer. Feijoada is another popular Brazilian meat dish. 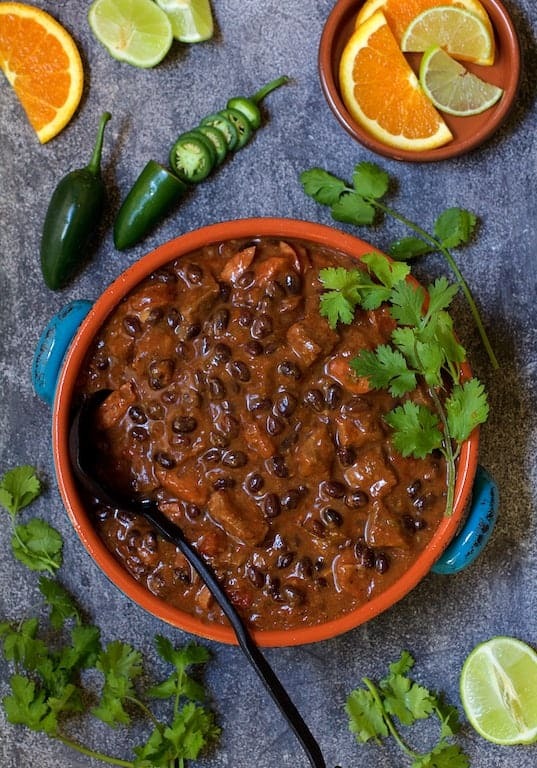 The meats used in feijoada vary by the cook, but it always includes black beans. My version, inspired by a recipe in Cuisine at Home magazine, may not be 100% authentic, but it’s easy to make and can be made with ingredients found in your local grocery store. 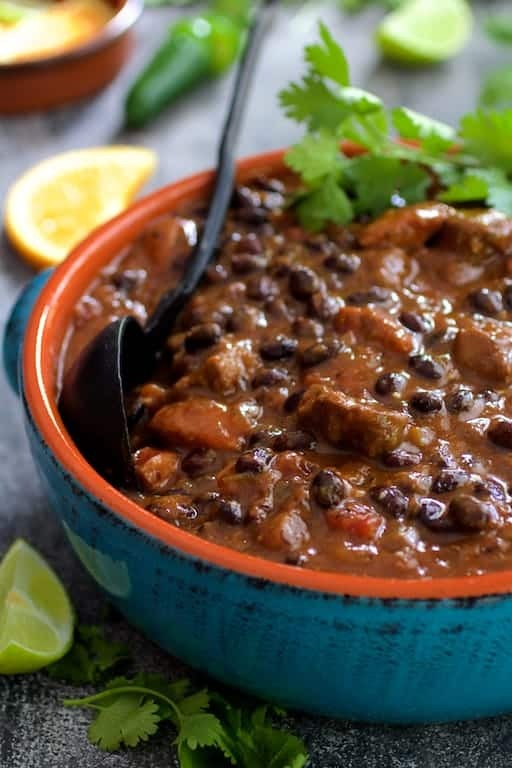 My flavor-packed interpretation of the South American classic has cubed chuck roast, smoky kielbasa, a touch of fruitiness from orange juice, the spark of red wine vinegar and heat from chili powder. To make this classic long-cooked dish super-simple, I make it in an electric pressure cooker. If you’ve never used an electric pressure cooker, you’re missing out, my dear readers! With an electric pressure cooker, you don’t need a burner and you don’t even need to watch it. It’s electric so you just lock the lid, set the timer and do other things. My Cuisinart electric pressure cooker has been a real workhorse! Love it! First, however, you’ll need to brown the beef. Although electric pressure cookers have a browning feature, the heat is not high enough and the sides are too high to get a good sear on the beef so I sear it on the stovetop. Use as little oil as you can get away with and don’t crowd the pan. Crowding the pan causes the meat to steam rather than brown and it will turn a grisly gray color. Here’s a great tutorial from Ming Tsai on how to flip food in a pan. 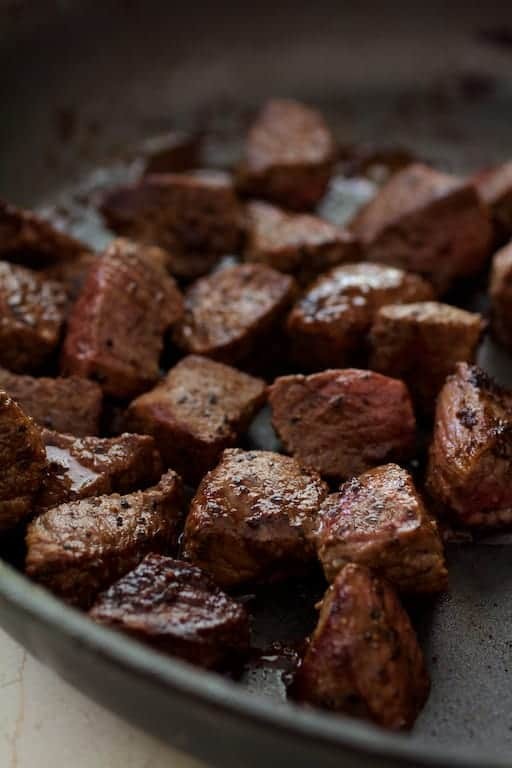 You might think at first you’ll have meat cubes all over your kitchen, but this method works great once you master the technique. This technique is much faster than turning each cube individually with tongs or stirring. When browned properly, you’ll end up with beautiful, caramelized beef ready for your pressure cooker. Electric pressure cookers don’t go all the way to 15 psi (pounds per square inch) of pressure. Stovetop pressure cookers do go that high, so you’ll need to adjust the cooking time. To make this stew the old-fashioned way, you can also do it in a 325-degree oven or on the stovetop. This is also a great dish for your slow-cooker. When the stew is done, release the pressure as gradually as possible. If done too quickly, the meat will seize up and turn tough. I use a damp kitchen towel to properly hold the pressure release valve for slow-release. Add canned black beans that have been drained and rinsed then stir in a corn starch slurry to thicken it. Bring it back up to a simmer for a few minutes. Turn the pressure cooker off to let the meat rest. The stew will thicken up more as it stands. This saucy stew is great over brown rice or by itself. Serve with fresh orange and lime slices, sliced fresh jalapeno, diced red onion and cilantro sprigs. Heat 2 tablespoons oil in an electric pressure cooker on the "saute" setting. Add the onion and poblano pepper and cook, stirring occasionally until beginning to soften, approximately 5 minutes. Add the garlic and cook briefly until fragrant. Turn pressure cooker off. Heat 1 tablespoon oil in a large skillet or saute pan over medium-high heat. Season the beef with salt and black pepper. Brown the beef in batches, being careful not to crowd the pan, adding remaining 1 tablespoon oil as needed. Transfer each batch to the pressure cooker. Add kielbasa, orange juice, beef broth, tomatoes, vinegar and chili powder and stir to combine. Secure the lid on the pressure cooker. Set pressure cooker to "High" and let the pressure cooker do its thing for 21 minutes. Release the pressure as s-l-o-w-l-y as possible. Stir in black beans and corn starch slurry. Set pressure cooker to "simmer" and simmer gently until thickened. Let stew rest for 5 minutes to thicken more. Serve over brown rice (optional) with jalapeno slices, chopped red onion, orange and lime wedges and cilantro sprigs for garnish. SLOW COOKER: Saute onion, pepper and garlic as directed. Transfer to slow-cooker. Brown beef as directed and add to slow-cooker. 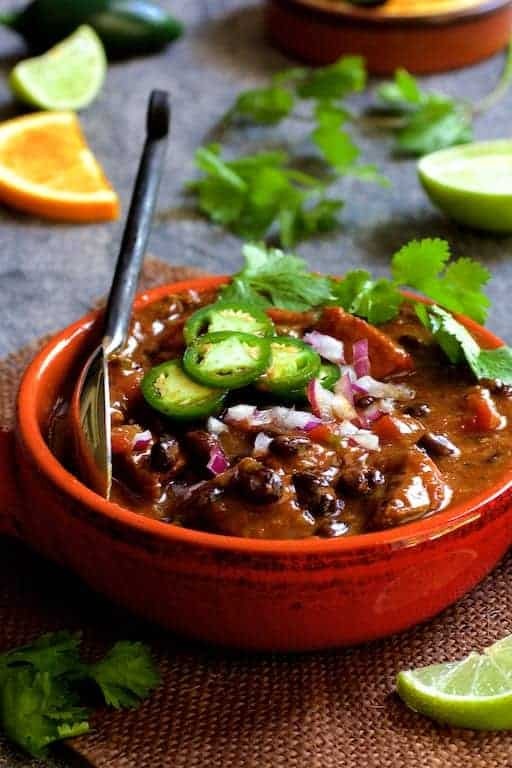 Add remaining ingredients (except black beans) and cook on High 4 hours or Low 8 hours. Add the corn starch slurry near the end. Stir in black beans and heat through. 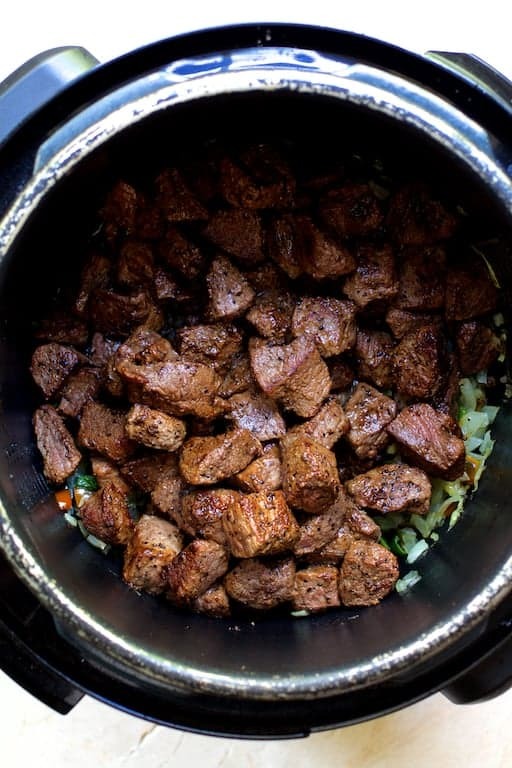 STOVETOP: Cook on Low 2 hours or until beef is tender. Add black beans and corn starch slurry and simmer gently until thickened. OVEN: Preheat oven to 325 degrees. Cover securely and braise for 2 to 2 1/2 hours or until beef is tender. Add black beans and corn starch slurry and simmer gently on the stovetop until thickened. What is hot chili powder? An Ancho chili powder? Hi, Ruth Ann, Thanks so much for your question. I get a lot of my spices at Penzeys and they sell various types of chili powder–hot, medium and regular. You could use any chili powder and if you want, kick it up with some cayenne. Thanks again and hope you enjoy! Is there a substitute for red wine vinegar?? Hi, Thao, Thanks for your question. You can use white vinegar or simply leave it out. However, I think it adds a nice little acidic touch for more complexity. Let me know how it goes! We have been fans of Cuisine at Home since they started. I believe I have every issue 🙂 They are great and the subscription is worth every penny!! Now that being said, your recipe looks so delicious and the photos are amazing!! We love all kinds of cuisines and this one in particular looks especially good for the cooler weather. Have a great week.